Andre Martin is Nike’s chief learning officer and vice president of talent development, whilst Drew Fifield is leadership development manager. Here, they describe how Nike seeks to unleash its human potential. Great design thinking should be applied to developing your people, as well as your products. Nike’s mission – to bring inspiration and innovation to every athlete (if you have a body, you are an athlete) in the world – begins with employees. Our team is the spark behind innovation that shapes the future of sport, and our talent strategy centres around building global, capable diverse talent to fuel growth. That’s why we put employees and their needs at the centre of our talent strategy. This consumer mindset demands that we develop a deeper understanding of the employees we serve, to truly know what motivates and engages them. It is our north star – it reminds us that every effort we take to invest in our talent is to unleash their full potential. As talent product and experience designers, we build empathy with our consumers – employees – to better understand their unmet needs; whether they are a financial analyst on their first day in a field office, a tenured retail manager eager to advance, or an executive transitioning into a complex and challenging role. We use this understanding as the fuel for a design brief that maps consumer insights with ideas. 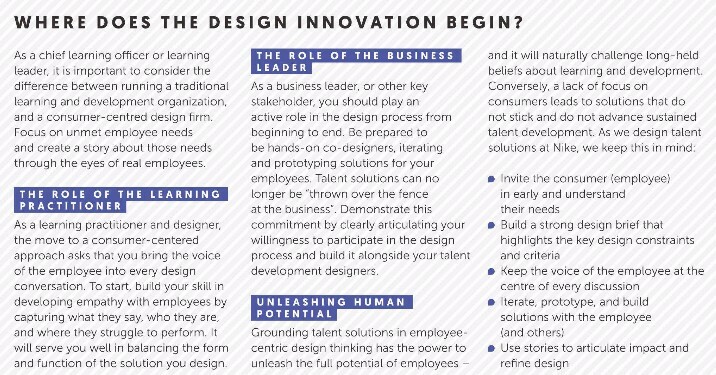 From there, prototyping and iterating solutions alongside the consumer begins by enrolling employees as co-designers. Inviting them into the process early not only builds a better product, it ensures we have champions who can demonstrate the value of the programme, from day one. Gone are the days of smile sheets, post-programme surveys, and a narrow view of participant satisfaction as the sole evaluator of success. At Nike, we use a co-design evaluation process that is built to encourage deeper learning from the employees we serve. We mine the insights we receive and work with employees to create better experiences for those who will come next. We do this by collecting rich stories from our employees and comparing that narrative with what we learned from them earlier in the process. In practice, does their experience match our intent for them? These stories are used as a frame of reference as we meet with stakeholders and leaders to assess the impact of our design. From that, new outcomes or consumer needs emerge, and we begin the design process once again.